This is the 2009 debut by a Dutch prog band that not only features female vocals -- Esther Ladiges has previously sung on albums by Ayreon and Ixion -- but is led by female guitarist/composer Eveline van Kampen and also includes a female keyboardist. They describe themselves as a symphonic prog band even though the guitar playing is more often in the metal idiom. References include older The Gathering, Magenta (but heavier and less refined), and Ayreon (but less overblown). But there is a bit more than that here. When Illumion omit the metal guitar and thus open up the mix, there are passages where the vocals show some of the artiness of Kate Bush, other passages where the keyboards are free to create more sophisticated textures. 59-minutes. "If ever a band showed promise of really going somewhere, it's Dutch group Illumion via this stunning debut. 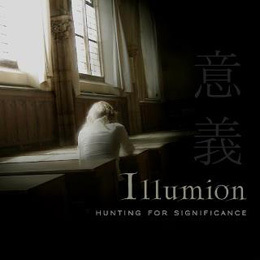 Playing a medieval-tinged light prog-metal hybrid, Illumion offers a sound firmly entrenched in old-school classic prog."